This page is a translated version of the page Dunn and the translation is 100% complete. Dunn was founded in 1921 and is between the fountain pen golden age producers, when every company was founded on the basis of some sort of the technical innovation. In Dunn's case the invention was a pump filling system very similar to the one used by OMAS in the Lucens many years later. That allowed the company to obtain a good market share. But Dunn's life was very short, the company closed its doors in 1924 (or 1927, depending on sources). In its short life however Dunn produced good quality and robust fountain pens, equipped with an efficient and advanced filling system that was years ahead to those of its competitors. Dunn was founded in New York in 1921, but curiously Charles Dunn, the inventor which gave its name to the company, was not between its owners because he died by tuberculosis just few days before the company foundation. It was him that in 1920 created and patented (Patent nº US-1359880) an original pump filling system similar to the one used by OMAS, more than 10 years later, for the Lucens. The new filling system allowed to store a large ink capacity, so that one of the slogans adopted for the market launch the Camel Tatler model was: "A regular camel for ink, goes a month without a drink". 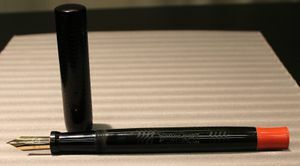 All Dunn fountain pens were produced using this particular filling system, which also characterized their style; the back of the pen, used as a knob of the pump filling system was carried out in red plastic (initially in hard rubber, then replaced by casein, a perishable and lower quality material), so it formed a distinctive feature of the pen, that in another slogan was described as "The fountain pen with the red pump handle". 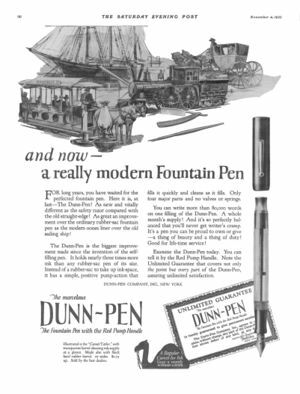 Initially the Dunn pens were made in hard rubber and were of good quality; the company distinguished itself by an extensive advertising campaign. The pump mechanism was simple and robust, and the pens were produced in a variety of models from small pens for women's to the Dreadnaught giant model (produced also in regular dimensions). An interesting feature, from a technical point of view, was also the introduction of a the caps composed by two parts, whose top section could be unscrew in order to discover the nib, but leaving it shielded by a protective cage in order to consent to fill the pen without pressing dangerously the nib on the bottom of the ink bottle. In addition to black hard rubber Dunn produced also bakelite pens with a transparent barrel (though most of the transparent models were later made in celluloid). Are also known to exists, but to be very rare, some metal overlay pens. The end of the company is not very clear, someone report a bankruptcy in 1924 caused by a prolonged strike of all the employees. Others say that the company continued operation until 1927, because there are trace of it having headquarters in New York, 71 Fifth Ave, when it went off market by its incapacity to adapt its production to the era of the colored celluloid pens. It seems that in 1924 there was a first instance of failure (whose causes seem to be specifically tied if not for a strike to serious problems of labor relations), which followed an attempt to reorganize the company. This had not happened, leading a few years after the final failure. ↑ look at this discussion about this topic in Fountain Pen Network. This page was last edited on 17 June 2017, at 00:31.